that encourages women to know their identity, place, and purpose. Sharin' Hearts: Woman to Woman encourages women to arm themselves with the Word of God, gain understanding how to live in harmony with each other while "overcoming" the forces that destroy. Topics from heaven to hell, making good life choices, understanding how Scripture enables women to be courageous witnesses for Christ, conscience-clearing, prayer and priority, and understanding the times are just a few of the subjects that are discussed. Janie Ratzlaff has been in ministry for over 40 years; traveling overseas for decades with her husband's job, she would team up with missionaries in the area and work alongside them. She has worked with Evangelical Mission Ministries, helping with teaching resources many churches that were planted in Mexico as well as a seminary in Mexico. She has also assisted in different areas of ministry with His Truth Transforms International. She trained and worked as a Biblical counselor and teacher. She has written and developed "Wellness Wisdom Workshops" and "Lighthouse Lifelines" which are curricula for her seminars and study groups. Sharon Hoskins is a wife and mother of two young children. She is the director of women's ministry at her church. She is the author of Bible studies and retreat workshops. Sharon holds a BS in Communication. 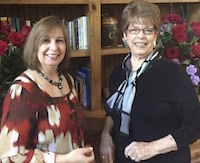 As a gifted encourager, she speaks to women through God's word and her own Christian journey. She is an advocate for mentoring programs and encourages all women to find a mentor with the goal of becoming a mentor themselves. She is the founder of Proverbs 31:30 Ministry - which is now officially known as Sharin' Hearts Ministry, Inc. - Sharin' Hearts Ministry is designed to encourage and equip all women to be all that God created them to be. Sharon is passionate about providing practical tools for women, enabling them to live confidently in a fulfilling relationship with God the Father. When you are prompted to download the Sharin' Hearts: Woman to Woman Ministry programs, click save. After the files have downloaded to your computer, you will need to Un-Zip the folder to view the MP3 files. You can usually do this by right clicking on the zip folder and selecting "Extract All."